Perhaps you may have heard that what is even more important than a person’s ‘IQ’ is their ‘EQ’, or emotional intelligence, and are interested in learning more. Emotional Intelligence involves, broadly speaking, the capacity to understand and manage emotion. Can this be measured? IQ tests are well-known assessments of cognitive capacity, however, the picture when it comes to emotional intelligence is more complicated. There are many free quizzes readily available to test EQ, but as is explained shortly, such self-report measures are not always accurate. Ability tests of EQ fare better. In the following article, the ‘ins and outs’ of emotional intelligence testing are explored in some detail. Along with a rich assortment of information, this article will also provide links to some free EQ assessments and samples of questions so that you can really get a feel for EQ tests. I hope it sparks your interest! What is an Emotional Intelligence Test? What is an EQ appraisal? Can EI Really be Measured With a Quiz? What’s in an Emotional Intelligence Questionnaire? Are There ‘Right Answers’ to EQ Assessments? What Does an EQ Score Mean? Is an EQ Test the Same as an Intelligence Test? So, just what is a test of emotional intelligence? Well, put simply, as opposed to a self-report scale of EI, an EI test is developed differently. You see, EI tests are based on the premise that EI consists of a group of skills that are employed in order to solve emotional problems. Therefore, as explained by pioneers in the research area of EI, Mayer, Caruso, Salovey & Sitarenios (2003), because it is developed from a skill-base, that EI is therefore a distinct ability that can be measured objectively. Another way of looking at the assessment of EI is an EQ appraisal. One example of an EQ appraisal is the Emotional Intelligence Appraisal that features in the best-selling work ‘Emotional Intelligence 2.0’ (Bradberry & Su, 2006). The appraisal was created in 2001 by Dr. Travis Bradberry and Dr. Jean Greaves and it may be administered in either online form or in a booklet. The EQ appraisal consists of 28 items and is performance based – it is designed to assess the behavior linked to EI skills. The assessment gives an overall EQ score, and a score for each of the four EI factors (Bradberry & Su, 2006). Research with The Emotional Intelligence Appraisal has found Cronbach alpha reliability ratings between .85 and .91 however, interestingly, a non-significant positive correlation was found between the appraisal and the popular EI test, the Mayer-Salovey-Caruso Emotional Intelligence Test (the MSCEIT). In the following sections of this article, you can certainly read more about the MSCEIT. Briefly, however, for the purpose of an introduction to this discussion, the MSCEIT is an ability model of EI. Researchers have suggested that there is a distinction between the constructs that are measured by the MSCEIT and EI Appraisal (Bradberry & Su, 2006). It was reasoned that this difference in models from which the assessments were developed – the MSCEIT is an ability-based assessment, whereas the EI Appraisal was based on Daniel Goleman’s ‘mixed’ model of EI. It has been claimed that scores on the Emotional Intelligence Appraisal predicted job performance more than the MSCEIT, and what’s more, it also takes one-fifth of the length of time to administer. In this section of the article, I will be focusing on the Mayer-Salovey-Caruso Emotional Intelligence Test, Version 2.0 (MSCEIT, V 2.0). The MSCEIT is a 141 scale that measures the four branches of EI, each branch reflecting specific skills – perceiving emotions, using emotions to facilitate thought, understanding emotions and managing emotions (Mayer, Caruso, Salovey & Sitarenios, 2003). Branch four – managing emotions: emotion management and emotional relationships tasks. Each of these 8 tasks is measured either by a discrete, single item or a group of individual items that make up an ‘item parcel’ (Mayer et al., 2003). Item parcels are collections of related items – so, for example, the ‘faces task’ consists of four item parcels, each containing five responses. Some items only require one response per stimulus so are distinct and free-standing (Mayer et al., 2003). Across the 8 tasks, the responses required take different forms. The test was designed this way so that the results across the response methods can be generalized, and also minimize the associated error in measurement (Mayer et al., 2003). So, some tasks use a 5-point rating scale, whereas others require a multiple-choice response. The ‘faces’ task is made up of 4 item parcels, each with 5 responses (Mayer et al., 2003). In this task, participants are presented with a group of faces, and they are required to respond with the specific emotion they can identify as portrayed in the face (Mayer et al., 2003). The ‘pictures’ task consists of six parcels each with 5 responses. It is similar to the ‘faces’ task, except that the target stimuli are abstract designs and landscapes, and to respond, participants select from cartoon faces that show specific emotions (Mayer et al., 2003). The ‘sensations’ task consists of five parcels, each with three responses. Participants match sensations to the emotions they generate – e.g. describing how ‘hot’ or ‘cold’ a feeling of envy is (Mayer et al., 2003). The ‘facilitation’ task is made up of 5 item parcels, each with three responses. This task requires a decision about the moods that are most closely associated with specific behaviors and cognitive tasks, in terms of accompanying them or assisting them. The example given by Mayer, Caruso, Salovey, and Sitanerios (2003) is “whether joy may assist planning a party” (p. 99). The ‘blends’ task consists of 12 free-standing items. Responders choose which emotions could be combined to produce another emotion – for example, that malice could be formed by combining envy and aggression (Mayer et al., 2003). The ‘changes’ task is made up of 20 free-standing items in which individuals choose the emotion that emerges due to another emotion intensifying – e.g. that depression is most likely to result from intensification of sadness and fatigue (Mayer et al., 2003). The ‘emotion management’ task consists of 5 parcels, each with 4 responses. In this task, responders are required to form a judgment about the best actions that can be taken by an individual in a story in order to result in the specified emotional outcome (Mayer et al., 2003). So, for example, the participant might read a story about a character and need to identify what this character can do to reduce their anger or prolong joy (Mayer et al., 2003). Finally, the ‘emotional relationship’ task. This task is made up of 3 item parcels, each with 3 responses. This task requires test-takers to decide what are the most effective actions an individual can take in order to manage another person’s feelings (Mayer et al., 2003). Putting this all together, it can be seen that the MSCEIT 2.0 is a comprehensive test of EI. In fact, it requires a total of 705 responses – 141 items are included, each with 5 responses (Mayer et al., 2003). According to Matthews, Roberts, and Zeidner (2004), there are a number of problems and serious omissions in the area of EI as measured by a simple self-report assessment. In actual fact, this issue is what led Mayer, Caruso, and Salovey to argue that performance-based measures are needed for EI to be understood as an actual cognitive ability (Matthews, Roberts & Zeidner, 2004). Their argument then resulted in the development of the Multi-Factor Emotional Intelligence Scale (the MEIS) and, more recently, the MSCEIT. To consider EI as a scientific construct, it is necessary to determine whether EI is a measurable phenomenon (Matthews et al., 2004). Self-report measures of EI have shown satisfactory internal consistency reliably across a variety of cultures, as well as more than adequate levels of test-retest reliability over 1 – and 4-month periods (Matthews et al., 2004). On the other hand, performance-based measures of EI have been shown to present a number of problems in terms of reliability (Matthews et al., 2004). All these issues seem to suggest that EI may not be able to be measured. Indeed. Whether or not EI tests actually measure a theoretical construct or trait is termed ‘construct validity’, and, in actual fact, Matthews and colleagues (2004) concluded that neither performance-based or self-report measures of EI meet the criteria for what is deemed ‘construct validity’. However, past research has found a relatively modest association between self-report measures of EI and actual ability measures (Matthews et al., 2004). What a complicated picture EI presents! What are we to make of these claims? Well, further research into the measurement of EI is certainly warranted – particularly into validation studies of self-report measures of EI. According to Matthews et al (2004), “there are major conceptual, psychometric, and applied problems and issues to be overcome before EI can be considered a genuine, scientifically validated construct with real-life practical significance” (p. 192). Other research, however, argues against what Matthews and colleagues presented in the 2004 paper titled ‘Seven myths about emotional intelligence’. It does in actual fact support the notion that EI can be readily measured using tests, particularity self-report tests. However, just because something is easily measured this does not mean that such measures are accurate. The fact that EI is made up of a range of skills does mean that self-report is not the most accurate way to measure EI (Matthews et al., 2004). This also means, however, that even though self-report measures are not effective measures of EI, that because EI consists of a range of skills and abilities, in a similar vein to the measurement of other skills, these skills can be measured! In other words, yes, EI ability tests are legitimate measures of EI. For each of these statements, the responders would rate themselves from not at all, rarely, sometimes, often and very often (Mind Tools, 2019). A variety of scales, quizzes and questionnaires have been developed for each of these methods of measuring EI. There are four general types of EI tests, which are described in more detail soon! Whilst all provide measures of EI, for situations where an accurate, objective assessment of EI is wanted (such as recruitment) the consensus from the research is to use the MSCEIT (Bradberry, 2014). Schutte and colleagues (1998) developed a measure of emotional intelligence based on the model that was published by Salovey and Mayer in 1990. Sixty-two items were found to be reflective of the dimensions of Salovey and Mayer’s model (Schutte, Malouff, Hall, Haggerty, Cooper, Golden, & Dornheim, 1998). Further studies of this 33 – item measure found it to have good internal consistency and test-retest reliability. Are you now curious about EI tests? Perhaps the following description of four examples of EI tests can capture your interest! This test was the first scientifically validated, and now the most extensively used, EI assessment worldwide (Australian Council for Educational Research, 2016). It was developed from 20 years of global research. The EQ-i is a self-report measure for individuals aged 16 years and older and can be delivered online. It takes approximately 30 minutes, and participants are required to respond to questions designed to assess key aspects of emotional skills related to life and workplace performance. Such skills have been shown to affect performance in complex areas such as conflict resolution and planning (ACER, 2016). The results from the EQ-i can provide respondents with information about emotional skills they can improve as well as those areas that they excel in – which can then lead to individuals having the capacity to utilize their strengths to maximize performance in daily tasks (ACER, 2016). The EQ-i 2.0 is administered from an online portal that achieves simple and efficient administration, scoring and reporting. Once an individual completes the test, a report is produced that takes the form of an inventory. The inventory includes 15 competencies that center around 5 composite areas of EI – self-perception, self-expression, interpersonal, decision-making and stress management (ACER, 2016). Although taking the test is free, in order to administer the test a practitioner must meet the requirements of the EQ-i qualification level. The EQ-i is based on Bar-On’s model of emotional-social intelligence, and it is accompanied by the EQ-360 (Consortium for Research on Emotional Intelligence in Organizations – CREIO, 2018). The EQ-360 provides a more comprehensive analysis of EQ because it also includes information provided by others. Observer ratings are then considered in conjunction with the results of an EQ-i-2.0 self-report to give a more detailed profile (CREIO, 2018). This test was developed by Brasseur & Mikolajczak and provides separate measures of intra-personal EI and inter-personal EI (CREIO, 2018). It looks at 5 core emotional competencies – identification, understanding, expression, regulation, and use of emotions – in the self and others. It has been extensively validated in research, with results taken from a total sample of almost 22 000 individuals (CREIO, 2018). It is available free of charge for research and clinical purposes. The full PEC consists of 50 items and takes approximately 1- 15 minutes to administer, and the short form includes 20 items and takes 5 – 10 minutes to complete. The PEC is a self-report measure, however, it needs to be administered by a psychologist who is familiar with the emotional intelligence and emotional competence research and theory (CREIO, 2018). The TEIQue was developed by Dr. K. V. Petrides and is available free of charge for academic and clinical research (CREIO, 2018). The full-form consists of 153 items, measuring 15 distinct facets, 4 factors and global trait EI. The short-form is a 30-item test that measures global trait EI which was developed from the full-form TEIQue (CREIO, 2018). Based on correlations with corresponding total facet scores, 2 items were selected for inclusion from each of the 15 facets of the full-form TEIQue. This questionnaire is also presented to gather ratings from observers – the TEIQue 360° and 360° Short-form (CREIO, 2018). Dr. Stella Mavroveli also designed the TEIQue Child-form that is suited to children aged 8 – 12 years. This questionnaire consists of 75 items which are responded to on a 5-point scale and looks at the nine distinct facets of trait EI in children (CREIO, 2018). The second part is made up of 20 ability pairs. Respondents are required to select one of two types of abilities that best demonstrates their strength (CREIO, 2018). Now that we have looked at EI tests, let’s consider the types of questions that appear in these assessments. The following questions, from the PEC (Profile of Emotional Competence), are similar to those used in a variety of EI tests. Hopefully they can provide you with an idea of what it may be like to do an EQ test! In fact, yes, there are so-called ‘right answers’ to EQ assessments – however, this only applies to the objective measures of EQ… obviously, there is no such thing as a ‘correct’ answer in a self-report assessment! Research has included efficacious ways to identify ‘correct’ alternatives in EQ tests– e.g. in facial perception, or meanings of emotions terms (Mayer et al., 2003). This has been claimed due to the convergence between expert and general consensus on EI measures (Mayer et al., 2003). So-called ‘right answers’ are based on criteria developed from research (Mayer et al., 2003). Handling diversity and cultural sensitivities (My Frameworks, 2017). EQ distinguishes emotional capacity as a distinct type of intellect. The average EQ score is in the range of 90 – 100, whilst the perfect EQ score is 160 (My Frameworks, 2017). What does an EQ score actually mean? Well, as well as contributing to success, EQ plays a role in everyday life (My Frameworks, 2017). Emotional Intelligence Test (2019). Psychology Today. Access here. Test your E.I: Free EQ quiz (2018). Institute for Health and Human Potential. Access here. How Emotionally Intelligent are You? Boosting Your People Skills (2019). Mind Tools. Access here. Emotional Intelligence Test (2019). Psych Tests. Access here. Emotional Intelligence Test Free – EQ Test Free Online (2019). Alpha High IQ Society. Access here. How Emotionally Intelligent Are You? (2017). My Frameworks. Access here. EI is closely associated with success in the workplace (Bradberry, 2014). TalentSmart, a worldwide leader in the provision of emotional intelligence, examined EI alongside 33 other key workplace skills. It was discovered that EI was, in this case, the strongest predictor of performance (Bradberry, 2014). Actually, EI explained 58% of success in all job types! How, then, is EI measured in the workplace? The Consortium for Research on Emotional Intelligence in Organizations (CREIO) have reviewed a number of tests that promise to measure EI in workplace settings, and have selected those for which there is a substantial body of research. Let’s examine these different measures. This is used to measure EI and enables workplaces to raise awareness of EI based on feedback (CREIO, 2018). 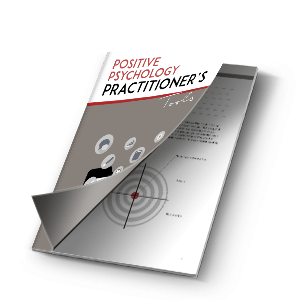 A multi-rater assessment, this test also encourages the coaching and development of crucial work capabilities. It takes approximately 30 – 45 minutes to administer. The ESCI-U provides universities with an emotional and social intelligence test at a much lower cost than the corporate version (CREIO, 2018). It assesses 14 key competencies – 5 emotional intelligence, 7 social intelligence, and 2 cognitive competencies. The multi-rater version is said to be the most well validated and widely used behavioral measure of emotional and social intelligence (CREIO, 2018). It has been used in schools. colleges and universities, and is currently used at undergraduate, Masters and doctoral levels in a number of countries (CREIO, 2018). The ESCI-U takes approximately 30 – 45 minutes to administer. The Genos Emotional Intelligence Inventory (Genos E.I). This assessment was developed from a wide range of peer-reviewed research, is available in many languages and is used in approximately 500 multi-national companies (CREIO, 2018). It is delivered via an online survey system which is modern and responsive. The Genos EI consists of 42 items and takes approximately 10 minutes to complete. Although it is designed to be used in workplaces, it has been claimed that it is a valid assessment for individuals aged 7 – 75 years (CREIO, 2018). This assessment of EI in the workplace was developed from the work of Vanessa Druskat and Steven Wolff who have led the application of emotional competence at the group level (CREIO, 2018). It provides a measure of 9 group norms that have been associated with team effectiveness. Also, this feedback can help groups to recognize their strengths and weaknesses, and therefore detect areas for improvement (CREIO, 2018). The GEC Inventory contains 57 items that measure the nine dimension of group EI reported by Druskat and Wolff. This is a self-report measure that looks at EI of individuals in teams. Respondents choose from a seven-point reference format (from 1 – strongly disagree to 7 – strongly agree) to items that are designed to engage them in a reflection of their own behavior. For example, “I am able to describe accurately the way others in my team are feeling” (CREIO, 2018). The WEIP is designed to look at two dimensions of EI – the ability to deal with one’s own emotions (which makes up scale one, consisting of 18 items) and, the ability to deal with others’ emotions (this is measured in scale two, which has 12 items) (CREIO, 2018). Scales 1 and 2 are each comprised of 5 subscales. Team EI is discovered by calculating the average scores of the WEIP for all team members. As you can see, whilst EI is crucial in a work environment, employers and leaders in team settings have a few options for assessments to choose from that measure EI. 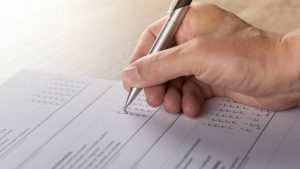 Queendom.com is a subsidiary of PsychTests AIM Inc, which is a high-tech psychometric company that produces a range of services and products based on an extensive battery of psychological assessments (Queendom, 2019). PsychTests AIM provides psychometric services and related products to a very diverse range of groups: recruiters, HR professionals, business owners, therapists, life coaches, athletic organizations, students, researchers, marketers, and even professors! (Queendom, 2019). As such, Queendom has developed ‘scientifically developed and validated tests and quizzes’, including the Emotional Intelligence Test. Well, the Queendom EI Test consists of 341 questions and takes approximately 60 – 90 minutes to complete (Queendom, 2019). The questions take the type of self-assessment, situational, and image-based questions. A test specifically developed to measure EI, the Queendom EI Test includes self-report and skill-testing components. What does the test provide? The Queendom EI Test provides an introduction to EI, an overall score, assesses a range of scales, and also advice – tips that are tailored from an individual’s results. Social competencies – looks at a person’s adaptable social skills and social insight. It examines the area of conflict – by looking at a knowledge of conflict resolution and conflict resolution behavior. The social competency scale also looks at empathy, flexibility, and the ability to read body language (Queendom, 2019). Drive – the ‘drive’ scale focuses on goal-setting, striving, self-motivation and self-awareness which are all a component of EI. Stress management – this scale looks at coping skills, emotional selectivity (in terms of magnitude) and emotional selectivity (in regards to precision). Furthermore, the stress management scale measures resilience, adaptability, and contentment. It looks at an individual’s positive mindset, their extreme rumination, and the congruence of their behavior according to values (Queendom, 2019). Self-regard – the self-regard scale measures the aspects of self-esteem, self-confidence, and assertiveness. It also looks at self-efficacy and the need for approval (Queendom, 2019). The grid below is an interesting graphical depiction of the dimensions and components of EI. The grid provides a clear ‘snapshot’ of EI, portraying what is a complicated concept in an easy-to-understand form. According to research, EI consists of 4 key skills that fall under two primary ‘competencies’ (Bradberry, 2014). These are personal competence and social competence. These skills can be portrayed in four separate ‘quadrants’. What would such EQ quadrants look like? Well, the four quadrants would be labeled as ‘what I see’ and ‘what I do’ (Bradberry, 2014). 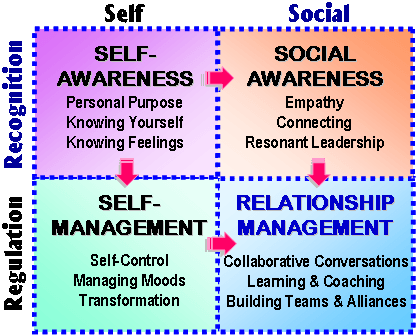 The quadrants of self-awareness and self-management make up ‘personal competence’. These two skills focus more on the individual and their interactions with others (Bradberry, 2014). On the other hand, social awareness and relationship management make up ‘social competence’. For many years, intelligence tests have been used to look at quantifying a person’s cognitive ability – their capacity to reason and ‘think’. However, EI is a relatively new concept. Hopefully, this article has shown that EI (or ‘EQ’) can be measured, so, can an EQ test be compared to an IQ test? There is a key, crucial difference between testing EQ versus testing IQ. Notably, IQ (the intelligence quotient) measures, broadly speaking, the ability to learn. It is stable, changing very little across the lifespan. On the other hand, the emotional quotient (EQ) taps into EI – which is a flexible group of skills. Therefore, like all skills, EI can be learned/acquired. It can be improved with practice. In other words, it is possible to develop a high EI even if a person is not necessarily ‘born with it’. As has been argued in this article, the ‘ability’ of EI can be measured…therefore, the closest comparison between tests of EQ and so-called ‘intelligence tests’ (such as the Wechsler tests and more recently, the Woodcock-Johnson test) is an abilities-based emotional intelligence test such as the MSCEIT. Abilities-based EQ tests, such as the MEIS and the MSCEIT assess the actual emotional ‘ability’ of a person, in the same way that an IQ test measures cognitive ability. Therefore, whilst not ALL EQ tests are the same as an intelligence test, abilities-based EI assessments share similar properties to IQ tests. The issue of emotional intelligence testing is a really complicated one. Although not all tests of EI can be compared to IQ tests, hopefully this article has explained that EQ is a construct that can be measured. Emotional intelligence is a relatively new area of positive psychology, so expect to hear more about it as time goes on! This article has provided a detailed look at emotional intelligence testing, including an examination of some EI tests, a closer look at whether EI can be measured by a simple quiz, and exploration of EI in the workplace. However, a highlight for me in writing this article was reading some sample questions from EQ tests – it gave me a good picture of what EI taps into. Have you ever measured your own emotional intelligence? Perhaps you can follow one of the links and do it today? If you have completed an EI test, were you surprised by the findings? Did they help you learn more about yourself? Please take a few minutes to share your thoughts! Mayer, J. D., Caruso, D. R., Salovey, P., & Sitanerios, G. (2003). Measuring emotional intelligence with the MSCEIT V 2.0. Emotion, 3, 97 – 105. Schutte, N. J., Malouff, J. M., Hall, L. E., Haggerty, D. J., Cooper, J. T., Golden, C. J., & Dornheim, L. (1998). Development and validation of a measure of emotional intelligence. Personality and Individual Differences, 25, 167 – 177.